What is Wicca and Witchcraft? 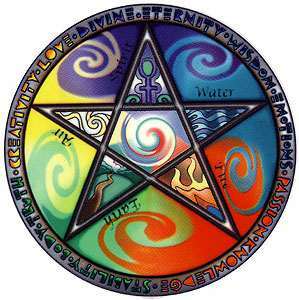 Wicca is a spiritual practice which believes everything in nature is connected by energy - some think of that energy as God or various Gods and Goddesses, others as a universal force similar to the force in Star Wars. Whatever it is, it is created by and connects every living thing on the Earth and the Earth itself. That force is within us all so we are all part of it (I'll refer to it in the rest of this article as God for convenience) and we all have God within us. No, it is a spiritual practice, not a religion. A religion is a set of rules that govern a spiritual practice and Wicca has no set rules or ruling body which means it is not a religion. While there are traditions in some branches or groups of Wicca such as Full Moon and other Rituals, their are no rules saying you must do this or that in order to worship God or be rewarded by God. This is one of the things that appeals to people about Wicca. It gives you freedom to worship (or work with) God as you deem appropriate rather than requiring you to adhere to things you may or may not fully agree with just to belong to that religion or be considered a good member. The closest Wiccans have to a "rule" is the Wiccan Rede ("rede" is an old English word meaning "advice" or "council" so even it isn't a rule). A common form of the Rede is "An it harm none, do what ye will." ("An" is an archaic Middle English conjunction, meaning "if." "Ye" is an archaic or dialectal form of "you"), so basically, "If it harms none, do what you will". (Harming none includes yourself and animals so Wiccans do not believe in suicide or animal or ritual sacrifice). No. A cult is a religious or spiritual group that follows one leader. often blindly following them and doing things considered harmful or illegal. Just as Wicca has no rules, it has no leaders. No governing body, no leader. While some Wiccans do form groups (sometimes called Covens) to study, share information, or perform rituals, they are groups of equals with any designated leader (or High Priest or Priestess) being a convenience for Rituals and organization more than a leader in the traditional sense. Like any group, ego can be a factor, but as Wiccans believe strongly in free will, "...do what YOU will", this is the exception and many groups will quickly fall apart if one member attempts to control all of them. No. Witchcraft (or "The Craft") is a separate practice not tied to Wicca or any spirituality. Anyone of any faith - Christian, Buddhist, Islamic, etc - may study or practice Witchcraft and that does not make them a Wiccan. Witches may practice without any religious or spiritual beliefs at all working with pure energy that they view as just energy and not anything divine. Witchcraft uses the energy field or God to affect change in accordance with their will. For Wiccans, this again means with harm to none - Wiccan Witches do not practice hexing or what is commonly considered "black" magic and they strive to change themselves more than others. As how you practice is open to each Wiccan to decide for themselves and there are no set rules as I've already said, it can be hard to understand what Wiccans actually do. Below are some of the most common practices, but is by no means exhaustive. Most Wiccans meditate in some form. Meditation is a great way to quiet your mind and expand your senses to connect with or feel God. Some use active meditative practices such as Yoga (especially Hatha Yoga) instead of sitting meditation. Some find a walk in nature or a swim as the way to connect themselves to God. Most Wiccans honor nature by following the seasons or the cycle of the moon as both affect the level of energy they feel. While there are no set rules or rituals, various covens and authors have tried to standardize or publish rituals for their own use or examples to new Wiccans. You are always free (and usually encouraged!) to alter these published rituals or create your own. Connecting with God means doing so in a way that you feel is best to you - for some that means robes, altars and a full set of ritual tools, Latin or other obscure languages. For others, it just means standing barefoot in the grass and gazing at the full moon. So that's Wicca in a nutshell. In my blog, I'll explain more about rituals and other topics.